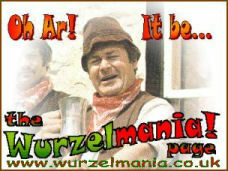 We have virtually no information about details for Adge Cutler and The Wurzels gigs. Adge Cutler And The Wurzels played their first gig around June 1966, prior to this all his appearances would probably have been as a solo artist. To start with, we have the dates of concerts which were recorded - and of course, the final gigs Adge Cutler played. If you have any dates and venues please let us know so we can start building this archive. Dig out those old ticket stubs, plough through those old diaries - let's see what comes up! A live concert in front of an invited audience - a various locals who forced their way in! All the songs on the first album Adge Cutler & The Wurzels were recorded at this concert. Adge Cutler & The Wurzels played on the pitch at half-time in the FA Cup 4th Round tie Bristol City against Southampton (Bristol City won 1–0). A live concert recorded to produce Adge Cutler's second Family Album, The audience were treated to cider 'on the house' - this must have helped with the atmosphere! The pub could only hold around 100 people, but around 500 turned up hoping to get in to see the band (and maybe get some of that free scrumpy?!). There was a riot outside the pub and a brick was thrown through the window! Mervyn Hancock, author of the book Wurzels World, records booking Adge Cutler & The Wurzels with Fred Wedlock and Joan O'Brien for a concert in his home town. It cost him £125 to book the acts from The John Miles Organisation - a small fortune to risk for a junior journalist in those days. Luckily the place was packed and he made a small profit! The live concert which provided the material for the Cutler of the West album. By this time Adge's popularity was such that a bigger venue than the Royal Oak was needed. The band was preceded on the record by an announcement from the Webbington compere Mike Reasons and a play-on Drink Up Thy Zider from the house band. Mervyn Hancock, author of the book Wurzels World, records the Radio One Club with DJ Alan Freeman, The Wurzels and 10,000 fans! A return to the Webbington saw material recorded for the Carry On Cutler! album; the rest was recorded at the White Buck Inn in Hampshire. The rest of the material used on the Carry On Cutler! album was recorded at this concert. Bank Holiday Festival at Essex Agricultural Showground, Chelmsford. In Mervyn Hancock's Wurzels World book, Pete Budd talks about his first gigs being entertaining the British troops in Germany. This would be the first time the band had played without Reg Quantrill. Adge Cutler & The Wurzels played their last ever gigs as a week-long residency at the Crystal Rooms in Hereford; Adge died on his way back from the concert. I am guessing that the show ran from the Monday to the Saturday, and that Adge's death is recorded on the morning of Sunday May 5th.